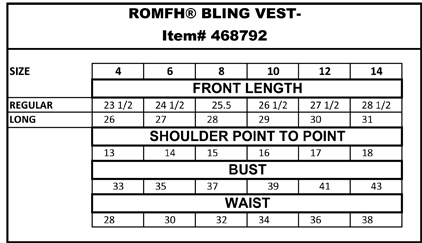 The Romfh® Bling Dressage Vest is perfect for Dressage Queens when the coats are waived and you want a pulled-together show look (without the muffin top)! Romfh takes the Bling trend and makes it beautiful with Black on Black authentic Swarovski® crystals on the collar and pockets of this slenderizing show vest. This will work perfectly with your Romfh Chill-factor(TM) Show Shirts.